I love any excuse for a new beginning or a fresh start. 2018 is upon us, and I find myself reflecting again on what I want to be different in my life in the upcoming year. I try to notice where the same old sins keep popping up, and the one that has been brought to my attention is how often I compare and envy those remarkable women around me. Specifically, I find myself being judgmental and envious of those who are able to be transparent about their flaws. I think the reason I envy that is because it is so hard for me. It feels like one of my self-proclaimed life purposes is to hide those flaws that some people seem so able to accept about themselves. I don’t like this about myself, and I know that a lack of authenticity is not the path to maturity. This continues to bring me back to the idea of TRUTHFULNESS as a practice for this upcoming year. It’s not that I’m not a truthful person. I excel at being diplomatic, and working to avoid hurting people’s feelings. Part of what makes me a good leader is my genuine care and concern for others. However, while I want to be loving and gracious, I fear that too often I do that at the expense of truthfulness. I want to be a woman who speaks the truth and does so without fear. In order to pursue this in 2018, I think what I need is to become more well-acquainted with the truth. It needs to be more of what I ingest in order for it to be more of what I communicate with my words and actions. PRAY HONESTLY. I heard a phenomenal pastor preach about how important it is for us to pray prayers that are honest and bigger than the reach of our ability. Instead of asking God for what I really want, I try and figure out what He wants, and pray that, to make His job a little easier for Him. I don’t know when or why I decided that was part of my human job description, but I want to give that one up this year. I want to be fearlessly honest in my conversations with God, because I believe that He already knows and that I am the one who needs to hear that truth the most. SHARE TRUE FEELINGS. I too often curate and filter my thoughts and feelings to try and appease the people around me. There’s certainly something to be said about discretion and wisdom, and I deeply value that. However, erring on that side leaves me feeling not known and not seen, rather than deeply connected, the way God created us to be. When I edit the honesty of what I share, I hinder the depth and authenticity of all every relationship I am a part of. AVOID FLATTERY. In the same vein of curating what I say when it comes to sharing my honest thoughts and feelings, I sometimes fill in the blanks in silences and interactions with flattery and pleasantries just for the sake of being liked and approachable. Again, this isn’t a bad thing, necessarily, so much so as it’s just not the best thing. The best thing is honesty in relationships and true connection, and flattery doesn’t serve that purpose. TAKE RESPONSIBILITY. It’s easier for me to take responsibility for other people’s stuff than for my own, and I have learned that I sometimes use that as a crutch to avoid looking at what I am actually responsible for. I wear busyness and other people’s stress as a badge of “care” and honor. When I pursue the truth about expectations and reality, I have to come to terms with what’s in my control and how very many things are not, so that I can be a good steward of what’s been entrusted to me. This is a humbling understanding, and keeps my perspective steady on God, who is actually in charge of everything. I truly believe that our calling as Christians, particularly as leaders, is to be intimately acquainted with truth. I see my shortcomings in this area, and as 2018 approaches, I am determined to be steeped in truth and to prioritize that over my addiction to being liked or easygoing. Here’s to a more truthful 2018! Sarah Rose Lochelt is a Southern-California native who is passionate about the power of communication and the connection that happens through conversation, especially when there is coffee involved. 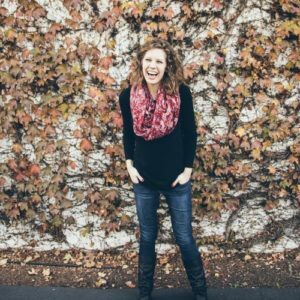 She is a pastor in the LA area and loves to write and speak about the lies of shame, the truth of grace, and the freedom that comes from relating authentically to one another, especially for women in the church. She always has at least one book to read in her purse, is infamous for making silly faces at babies in public, and could live on pizza for every meal.